Ovarian cancer claims the highest mortality rate of all gynecologic cancers – as high as 70 percent – in part because the disease is rarely detected earlier than stage 3 or 4. When the disease is discovered early in its development, however, survival rates are high. An effective screening technique for early detection could not only save lives, but also drastically improve their quality. Graphic representation of falloposcope image resolution. Image credit: University of Arizona. 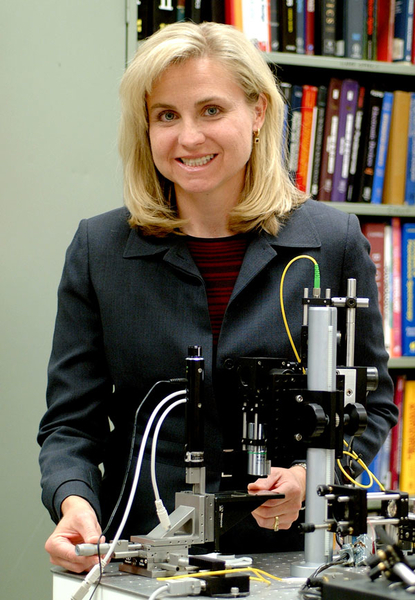 With a $863,000, three-year grant from the United States Army, Jennifer Barton, director of the BIO5 Institute and professor of biomedical engineering, biosystems engineering,electrical and computer engineering and optical sciences, is continuing her research into a disposable falloposcope to detect early-stage ovarian cancer. A falloposcope is an endoscope used to image the fallopian tubes, where researchers now believe ovarian cancer originates. Jennifer Barton. 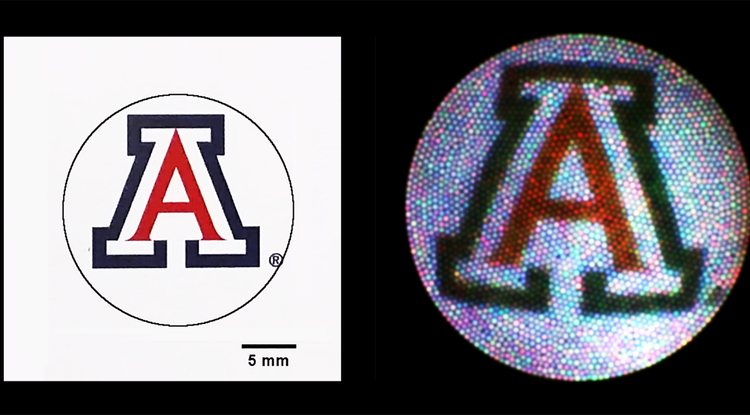 Image credit: University of Arizona. While Barton and her team have conducted studies to demonstrate the feasibility of a minimally invasive, inexpensive and highly sensitive falloposcope, this funding will allow them to ready the device for the clinic and test it for the first time in vivo, or in a living person. “Previous studies were great for showing that the idea was sound, but of course there’s a lot of engineering that goes into building something that is safe, robust and easy to use in a surgical setting,” Barton said. Certain factors, including a strong family or personal history of breast or ovarian cancer, endometriosis and alterations in the BRCA1 and BRCA2 genes, can increase a woman’s risk of contracting ovarian cancer, so physicians often counsel these women to have their ovaries and fallopian tubes removed as a precaution. Prophylactic salpingo-oophorectomy, or precautionary removal of healthy ovaries and fallopian tubes, isn’t a simple procedure, nor is it without consequence. It means loss of fertility, hormone replacement therapy to counteract the early onset of menopause and the psychological toll that comes with both. The risk of cardiovascular disease after menopause, or after the procedure, increases as well. Barton’s collaborators include Dr. Kenneth Hatch, UA professor in the Division of Gynecologic Oncology, and Dr. John M. Heusinkveld, UA assistant professor and associate director of the Division of Female Pelvic Medicine and Reconstructive Surgery. Both are part of the Department of Obstetrics and Gynecology. Barton also has a team of optical sciences graduate students and recently graduated engineers helping with fabrication of the falloposcopes. While Hatch and Heusinkveld will be testing the new device in real volunteers, they’ll be doing it as safely as possible by only testing the device in patients already scheduled for a hysteroscopy or fallopian tube removal and in those willing to volunteer as test subjects. Essentially, the falloposcope will be tagging along with the hysteroscope, adding very little time to the procedure and virtually no additional risk to the patient. In fact, if the falloposcope does, by some chance, damage the fallopian tubes, Barton and her team will be able to examine the damage to the removed tissue to see what went wrong and make adjustments accordingly. While this study will not answer the question of whether or not researchers can actually detect early ovarian cancer in vivo, it will show that they can conduct the falloposcope procedure in a living human and gain quality images. Source: University of Arizona, by Emily Dieckman.